Two tandem skydivers plummeted to their deaths after their parachute failed to open on Aug. 6, in Acampo, California. “It appeared that the parachute did not deploy until after impact,” San Joaquin County Sheriff’s Office wrote in a statement. The names of the two men are being withheld until they’re identified by their families. The Federal Aviation Administration will investigate the incident. 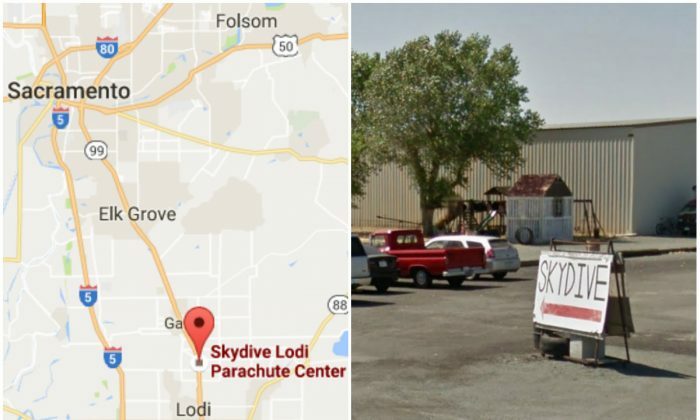 Skydive Lodi–The Parachute Center has been in the news multiple times for past accidents. In February, an experienced skydiver died there after his parachute malfunctioned, FOX40 reported. The owner of the center, Bill Dause, said the company was not at fault since the skydiver packed his parachute himself. Dause said his operation is probably just as safe or safer than others. But he also said he doesn’t keep track of how many people have died there. “The unfortunate numbers, that it’s not important to me. We do everything we can to prevent the next one, and we see why the other ones have happened,” he told FOX40. FOX40 counted 14 fatalities since late 1980s (the center opened in 1964, its website states). That would rise to 16 if counting the two on Saturday. Yet to compile a safety statistic, one needs to know how many jumps the center facilitates a year. When called on Sunday, the staff member who answered said the company doesn’t keep count of any numbers, including how many times their planes took off the day prior to the accident. Previously, Dause had said they do “thousands and thousands of jumps” a year. One out of 133,000 skydiving jumps ended up in fatal accident in 2014, according to the latest available number from the U.S. Parachute Association. That would mean Skydive Lodi would need to perform over 71,000 jumps a year to maintain the safety record of 133,000 jumps per fatality, assuming FOX40 started to count the fatalities at the facility in 1986. Since the company states it has four airplanes and each can carry about 9 passengers, each plane would need to take off six times a day, 365 days a year, to maintain the safety average mentioned above. The problem with such statistics, however, is that they miss the nuances of what’s happening on the ground, or in these cases, in the air, according to DropZone.com, an unofficial clearinghouse for skydiving accidents. Most skydiving accidents happen due to a “pilot error,” like a mistake landing, collision with another skydiver, or a failure “to respond correctly to a survivable equipment malfunction,” the website states. The website advises against blaming the facility, since many times they only provide the airplane lift and the skydiver brings one’s own equipment. Online reviews of Skydive Lodi are mostly positive. Customers have praised “great” and “experienced” instructors and cheap prices. The company offers a tandem jump with an instructor for as low as $110 with a tip. A skydiver with own equipment can take an airplane lift for $15. The minority of negative comments seemed to focus on “rude” staff that’s sometimes unwilling to provide information.